Common courtesy in the United States at least is when someone sneezes you tell them “bless you.” Why is that exactly? Or have you ever sneezed and someone told you that “someone’s probably talking about you?” Why do we say these things and where does the story behind these nowadays customs originate? Today, I’m going to go over the weird observances we have with sneeze myths. As you may have thought, saying “bless you” to someone after a sneeze has many different origin stories. The one that most are familiar with takes place back in Rome during the medieval times when the spread of the bubonic plague was prevalent. Considered to be one of the deadliest plagues in human history, symptoms of the disease included fever, headaches, vomiting, swollen lymph nodes, and serious coughing and sneezing. The myth comes from the belief that Pope Gregory the 1st would walk around and bless people in hopes that they would survive the life-threatening outbreak. The other origin story stems from an early superstition. In times past, it was believed that the spirit was some sort of air that was trapped inside our body. When people sneezed, it was their thinking that the soul would slowly leave the body, while an evil spirit tried to come into yours. Saying “bless you” would keep the evil spirits away from entering your body. So we figured out the “bless you” origin story, but what about when people say “someone is talking about you”? No one knows exactly where this myth originates, but it can be traced back to Japan. When you sneeze for no reason, the common belief is that someone is talking/thinking about you. This idea can be seen in many anime cartoons that surround this culture. It is also believed that sneezing once means someone is gossiping nice about you. Twice means it’s not as nice but still kind. Three times mean that the gossip is hurtful or negative. Bonus myth: In British culture, it was believed that babies were under a spell from a fairy until they had sneezed. With all these myths in mind, it is clear to see that we have some strange fixations on sneezing. 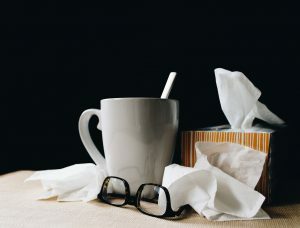 As the flu season continues, be sure to do everything you can to fight the flu, including washing your hands and covering your sneezing and coughing. If you have an insurance policy, it would be wise to still get a flu shot. No insurance? Give us a call at 888-539-1633 we can help! You can also check out our article on ways to stop the flu here. ← Stop-Gap Passed: What Will the Government Do Next?